DHL and The South African Legion step up to the mark to deliver prosthetic limbs to veterans in need. 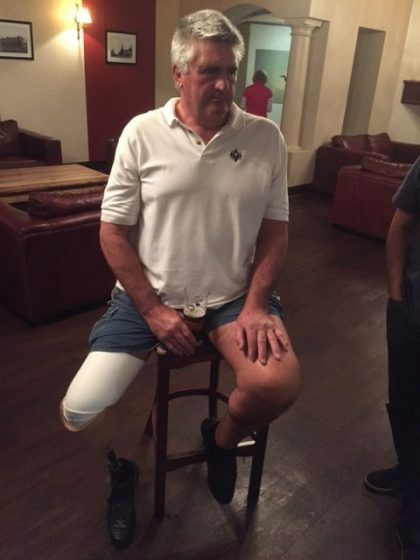 Pete Hall with his new prosthetic leg. In 2015, as part of the Project Gemini exchange programme blind veterans from South Africa and the USA joined their peers in the United Kingdom for a week of socialising, learning and camaraderie. Little did they know that a real opportunity to dramatically improve the lives of two military veterans would arise from it. Peter Hall and Renier Heyns, the two South Africans in question, are members of St Dunstans Association for South African War Blinded Veterans, and they were both injured in the “South West African/Angolan Border War” as serving members of the South African military. Following the event in Brighton, Mr Mark Cornell, Past President of the US based Blinded Veterans Association acquired two sets of prosthetics donated to Peter Hall and Renier Heyns by an American hospital. Problem was, the prosthetics were a long way away at Mark’s home in San Antonia, Texas, and they where needed by St Dunstans in South Africa. 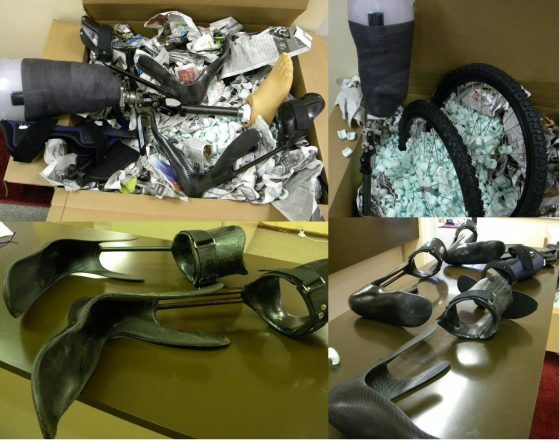 To get these much needed prosthetics to South Africa; Colin Williamson sent an email to Cameron Kinnear of the South African Legion of Military Veterans (UK branch) looking for advice on how he could obtain some assistance in covering the rather significant cost of shipping prosthetics from the USA. Cameron quickly kicked into action obtaining much needed shipping information and briefed his peers in South African Legion, some shipping quotes were obtained, but it was immediately apparent that this would be unaffordable to the charities and veteran associations concerned, and would take many months to raise the monies. Peter Gillatt took the reigns as Project Coordinator on behalf of the South African Legion to make contact with the donor parties and act as liaison. Peter also put out a message to the members of the Legion calling for skills and assistance and Wayne Stockton, (a military veteran himself), quickly responded. As it turns out Wayne works at East Midlands Airport, and made an appointment to see Peter Bardens, Operations Director of DHL. It became immediately clear that DHL were very capable and very enthusiastic to assist. DHL then very generously agreed to sponsor the delivery much to the appreciation of all concerned. Scheduling and logistics planning kicked off immediately with Peter Gillatt and Wayne Stockton coordinating the activities between the various parties, ensuring the correct documentation was in place and keeping everyone appraised of the progress that was being made. Due to the Christmas closure of the recipient organisation, St Dunstans in South Africa, it was decided to postpone the delivery until after the holidays. 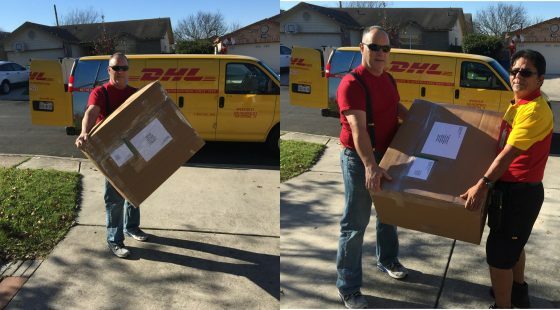 So, on the 4th of January the DHL collected the parcel of prosthetics from Mark Cornell in Texas, USA and delivered it safely to Andrea Burton at St Dunstans in South Africa on the 8th of January 2016. A job very well done all round, now all that remains to be done is the process of modifying the prosthetic legs to fit two very appreciative veterans. This very successful operation was a wonderful demonstration of the kindness of the human spirit and the will to overcome challenges for the greater good. Charity is not just about just donating money, it’s about engaging all sorts of resources and skill sets to actually deliver aid and support to people in need. The South African Legion would like to extend a huge mention of appreciation to DHL for the magnificent and generous assistance they provided in making the start of 2016 a very special occasion for two old Veterans.